It’s not just a cliché to say that in order to get better you must be willing to get worse when it comes to training. And though it’s easy to rationalize on paper it’s often hard to buy into a periodizationl strategy when you’re suffering and not seeing tangible improvement. This has been my July. A month of PAP workouts, running drills, and short hard efforts on the bike are hopefully improving my power and top end speed but I’m is such a state of breakdown it’s impossible to gauge how it’s working. Re-tooling neuromuscular patterns wreaks havoc on the system and keeps me on edge. I don’t feel comfortable and find myself wondering if I’d have been better off overall to keep training my strengths in a way where I know I’d peak for my race in Sept. As I said at the start of the month it’s a gamble to try this on such short notice and I won’t know how it went until I begin integrating my training in August. At least this hay is in the barn and now I’m looking forward to unwinding with a recovery trip to France with some of Beachbody’s top coaches. Where I can tell I’m getting stronger is in my PAP workouts. I’m leaping higher and have much better lateral stabilization. Last night I did Asylum Back To Core and Relief as a recovery day and it felt like one—itself an indication that something good is happening. But all this power gain comes with a loss in endurance and, hopefully, there’s time left to bring this back to competition level. Peaking for races is always tricky and it gets even harder when you also attempt to throw in a major body composition alteration. This is why P3 tries to get as much time with athletes as far away from their season as possible. The longer time period you have to easier it is to make major changes. In these videos are the Utah Jazz’s Derrick Favors and Gordon Hayward. Both showed promise as rookies but need improvement to become household names in the NBA. To get there they’ve been working at P3 on weaknesses since the season ended. In the two examples of PAP complexes you’ll see Hayward jumping off of one leg to try and offset a discrepancy in leg strength, while Favors’ targets lateral explosiveness. Very motivating for those days you aren’t in the mood to bring it--as well as a small preview of P90X2. 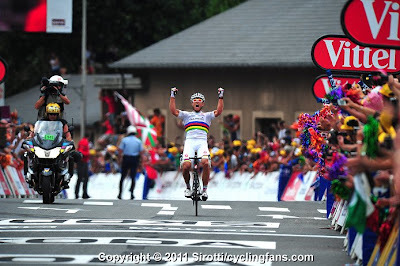 "One Hell of an Epic"
I’ve got to admit it’s been the most spirited Tour de France in a long time. We’ve seen sprinters winning mountain stages, rouleurs wearing the sprint jersey, and the guy who’s dominated every recent grand tour he’s entered getting dropped on climbs. The race leader is currently an attacker who hunts for stages and claims that he doesn’t train with a power meter, heart rate monitor, or even a speedometer. With only three stages to sort out the overall it’s an absolute crap shoot as to who will come out on top, leading one Eurosport commentator to sum it up as “one hell of an epic”. And to think, when it all began I was ambivalent. The flat stages have been the most fun. Cav looks as though he might finally hang onto Green but it hasn’t been easy, especially since when the roads have gone up the sprinters have not only hung on to win intermediate points but actually won stages. World Champion Thor Hushovd has been the man of the race, followed closely by Phillipe Gilbert, Tommy Voeckler, the HTC lead out train, Garmin/Cervelo, the country of Norway, and a slew of other guys who’ve been fighting out every mountain, hill, sprint and finale like its life or death. To tune in on the Interweb click here. However, it wouldn’t be bike racing without a bit of controversy. Over at the The Inner Ring you see a lot of banter from those a bit more in-the-know, or at least willing to dish dirt, than the TV commentators. Such as this tidbit on how race heroes according to the press might not be the most popular guys among their colleagues. Then, of course, there’s Lance. Even though he’s retired, this time we think for good, it wouldn’t be the Tour without some further revelations about “the comeback of the century” or whatever other monikers the PR machine heaped on the Armstrong era. BD athletes Kate Rutherford and Brittany Griffith attempt Venturi Effect (IV 5.12) on the Incredible Hulk, High Sierras, CA from Black Diamond Equipment on Vimeo. The headlines have been filled with plenty to comment on but, alas, I’ve had no time to blog. So instead of getting all hot and bothered about the latest sad news about our health enjoy a little stoke instead. Black Diamond has been making a lot of cool vids lately. This one features my friend Brittany climbing one of the most imposing granite formations in the High Sierra. For an added bonus, check out the one below where Brittany’s husband sandbags here into leading some scary. My wife says “she sounds just like me” which is something to take solace in as a recreational athlete because Brittany is rad. BD athlete Brittany Griffith climbs at Australia's Taipan Wall and Mount Arapiles from Black Diamond Equipment on Vimeo. I haven’t ranted in a while but figure all this nonsense about the USDA’s food pyramid, um, plate is a good time to get back in the game. Apparently, at least according to a lot of media sources, making a rational change from pyramid to plate (since, ya know, we eat off of plates) is going to put the kibosh on the obesity epidemic. And while I applaud the USDA’s logic I’m offended by their ignorance. 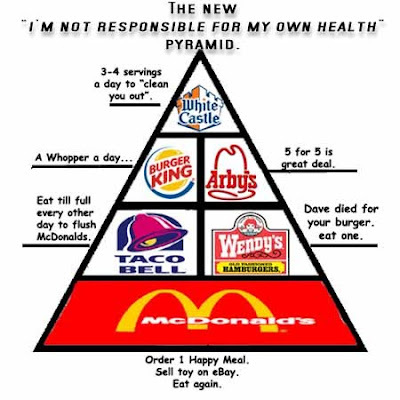 We aren’t fat because we can’t covert tiers on a pyramid into portions on a plate. We’re fat because our diets consist mainly of things that don’t appear in their guidelines at all. Let’s have a look at the revolutionary My Plate, shall we? Hmm, we’ve got a plate segmented into fruits, grains, protein, veggies, a small side of dairy and a pretty girl eating an apple. How quaint. Never mind that you don’t need any meat, grains, or dairy in your diet or that it lacks nuts, seeds, legumes, and an entire macronutrient group because that’s minutia compared to my point. For a level-headed examination of “My Plate” here’s a link to Denis Faye’s less vitriolic prose. What I’d like to know is where are the sections for soda, chips, beer, fast food, and the hot case down at your local AM/PM mini mart? Because, from what I’ve seen, this should make up most of My Plate, assuming that when they say “My” they mean “American”. I don’t know who it was who decided our problem was that we couldn’t figure out how to insert a triangle into a circle. As a professional observer I’d say it has a lot more to do with people’s notion that a French fry is a vegetable and Cherry Coke is a fruit. We find our protein at places where the same ardent watchdog, the USDA, states “ meat” only need contain 40% actual meat and god knows what else. We get our fill of dairy on “2 Large Pizzas for $5” night and our grains come from various bags of processed –to-the-point-they-might-as-well-be-sugar swill at convenience shops. We are fat, quite simply, because we eat a lot of crap. If our diets actually consisted of nothing but the foods on My Plate we’d be a lot healthier, no matter how much we ate of any of them. Look, I’m all for more nutrition education. We need it. Badly. I’ve had clients state they were allergic to water, were advised by their doctor to drink more soda, and challenged me as to what point they could stop exercising—seriously, the exact line was “... you can’t tell me Steve Edwards and Tony Horton still have to exercise to look like that!” So I’m all for education; I just don’t think a government agency beholden to the corporate influence of Big Food should be the ones teaching us. There’s this bike race in France that started today that, for some reason, I just can’t get psyched on this year. Maybe if I watch Le Velo a few more times my mind will get straight. Maybe it’s a self-imposed tactic hoping my ambivelance will lead to some great racing. Yeah, yeah, that’s it. It's just that deep down I don’t believe Contador can lose. Plus, his main rival is pretty boring. There are some cool stories on the undercard, particularly Chris Horner, but c’mon. Horner’s as old as Lance; how can he be a serious contender? And, even the the parcours means that Schleck could conceivably lose no time to Contador in the time trials (a TTT and his team has fastest time trialist in history and a short, hilly, TT near the end) I’m still not buying that when it comes down to winning a grand tour anybody is dropping Contador—and his special Spanish beef—when it actually matters. So c’mon guys, prove me wrong! Uh-oh. The first stage just wrapped and, shockingly enough, Phillippe Gilbert won. That guy hasn’t won a bike race since, like, the last bike race he did. He might win four stages in the first week. Then the Contador show starts. So I guess until someone shows that things are different I’m going to keep getting’ dirty. re: hmm, ac gets behind a crash and loses over a minute. tactic could be working... thanks josh and reed for the vids.